We originally ran this post in 2015, but we brought it back because we had a hankering for butter and toast. Today: Make your own butter in a one-step process using fresh cream, a mason jar, and your bicep strength. 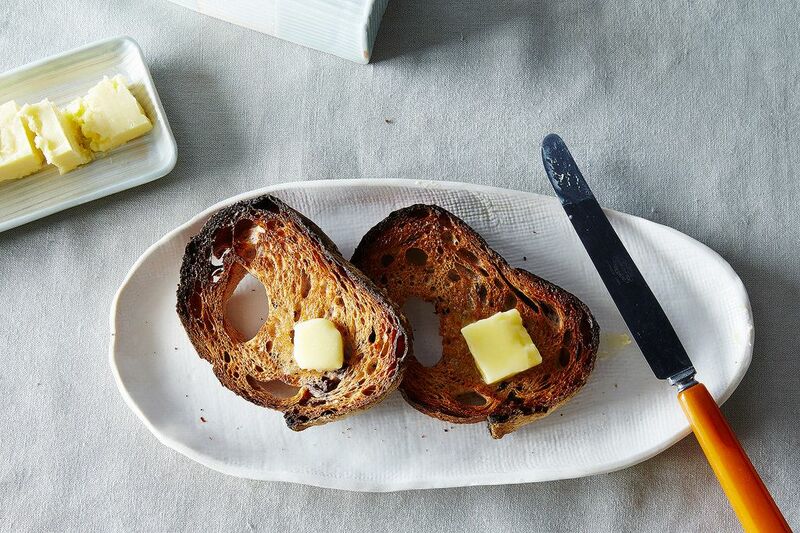 This batch of rustic homemade butter looks right at home in our new embossed ceramic butter keeper by Tjossem Ceramics—and pretty darn cute on burnt toast. Ever buy a carton of heavy cream when you just need a spoonful? Or maybe you're fresh out of buttermilk for a recipe, but not that excited about splashing vinegar into some milk to make biscuit dough (though that does work!). Need something to fry your eggs in, but you just used the last pat of butter on a slice of almond cake? All of these conundrums can be solved with a simple scientific fact that your grandmother knew but might have forgotten to tell you: Butter and buttermilk can be made from shaking the daylights out of heavy cream. In other words, 1 (cream) + 0 (nothing) = 2 (butter AND buttermilk), so call your calculus, biology, and physics teachers and tell them you can graduate on time after all. 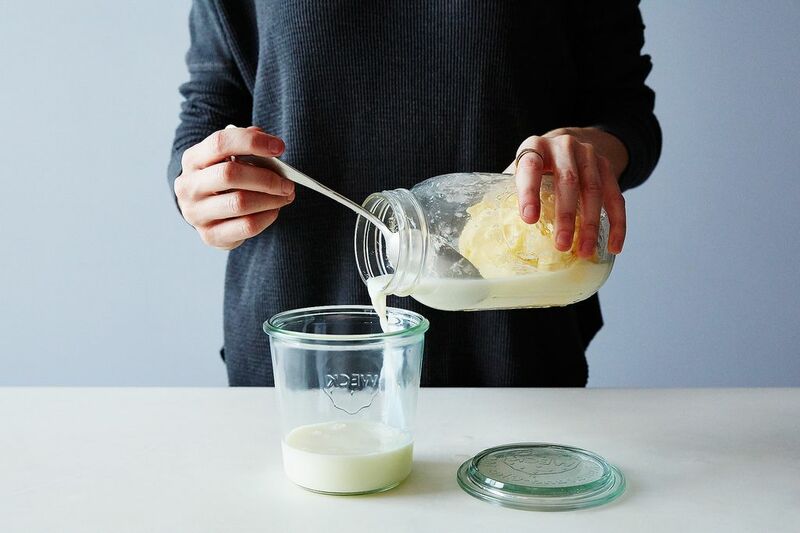 Instead of tossing the rest of your leftover cream or running to the store, put it in a mason jar and shake it—in just 15 minutes, the cream breaks into a mass of butter and a puddle of buttermilk. Strain. Spread. Pour. Voilà. 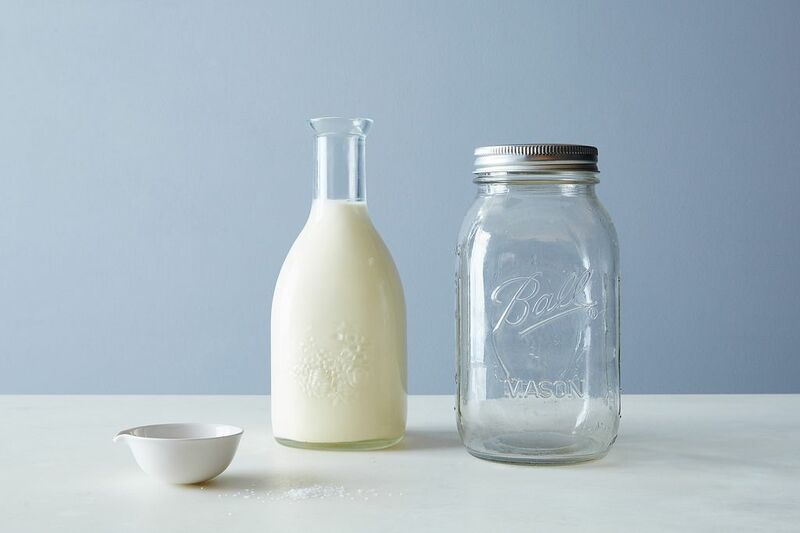 Pour the cream in a mason jar (leaving plenty of room for air), seal the lid tight, and shake it to pieces—literally. It won't take long for the cream to become whipped, and then it will get deceptively thicker, but it's not butter yet! Power past this very whipped cream stage until it breaks: The liquid that forms is buttermilk, and the solid is your butter. We recommend inviting a friend or a strong child to take turns with you, but the whole process takes no more than 15 minutes and is a good chance to practice your cocktail shaking technique. Strain the buttermilk away and scoop out the butter onto some parchment. If you like salted butter, sprinkle a little on and mash it around to combine. Shape the butter into a log, wrap it in wax paper, and refrigerate to harden. Alternatively, you can press it into butter molds before letting it get cold. That's it! When life gives you fresh cream, use some of it to make butter (and don't think too hard about the math). If the shake, shake, shake feels like a little much today, our shop carries a clever hand-cranked butter churner. Pour the cream in, put on a podcast, and starting turning the handle. It makes us feel like pioneers—minus the log cabins. 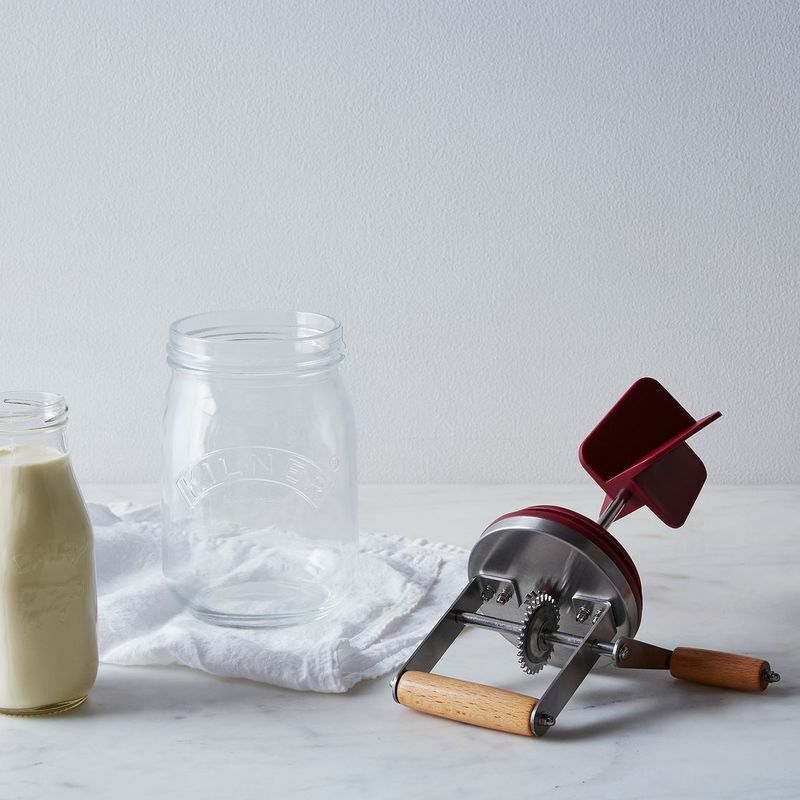 That cream is just a churn away, thanks to the Kilner Butter Churner, now available in the Shop! Here's a method that saves dirty dishes and is easy: Put the cream into a wide-mouth pint mason jar, roll it back and forth with your foot (for about 15- 20 min?) while watching TV. Rinse and knead the butter with a spoon right in the jar, draining as needed. Refrigerate in the jar! No scraping or cleanup required. I've been making butter for several years and I have a few tips. 1.. Buy the very inexpensive Oster Top Chopper (Target, uder $30.00). It's the least messy and QUICK butter churn (Very heavy cream approx. 2 minutes).. Pour cream into the 4 cup container. 2. 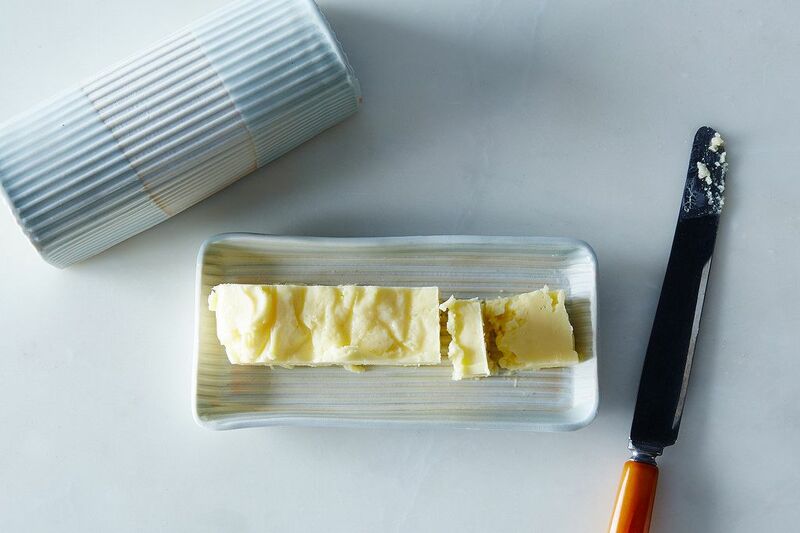 For a better tasting butter. European style, buy some sour cream Culture . (Amazon appox $10 ). 3. For Aromatic butter (popcorn type) add a pinch of LIPASE enzyme. ( Cheese making supply house). 6. Rinse until no milky liquid shows. 7. Use in a week, or Freeze for a year. If you don't freeze it, make sure as much milk solids have been rinse away. Otherwise, butter will mold. 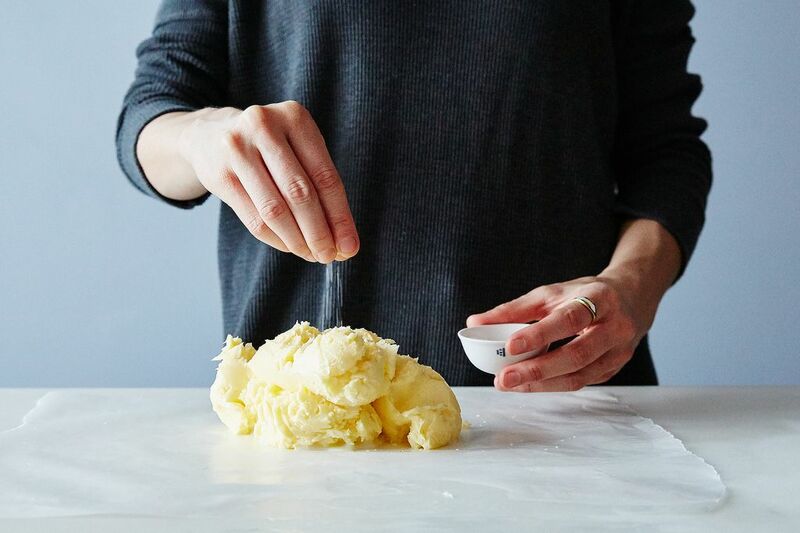 Use a stand mixer with a whisk, WAY faster and works just as well. I've been making butter at home for a few years now, since a few months after I started buying raw milk (for my "pets"...ahem...) and pouring off the cream. Making raw ice cream took some experimenting and the cream sometimes soured in the meantime. I quickly got tired of finding recipes calling for copious amounts of sour cream (although this was as real as sour cream gets!). So I started making butter, first in my stand mixer like others here; and when that got too messy with the "breaking" announcing itself all over the walls and countertop I switched to my food processor. As someone suggested I also "wash" the butter after draining off the buttermilk and store it in flat, roundish patties wrapped in brown wax paper in the fridge. This gets used for toast, pancakes - anything calling for a bit o' butter that doesn't involve baking, melting or otherwise defeating the purpose of all those good bacterial critters. I've also made use of ultra-pasteurized store-bought cream, but first I re-pasteurize it by boiling and then "culture" it with a bit of yogurt to make creme fraiche first. Making butter from spoiled pasteurized cream is dangerous. Sorry to burst your bubble but what you'd get from this method using fresh cream is NOT real buttermilk. In the old days, butter was made from cultured cream, like yogurt. So the reside was also cultured. Ummm wrong. I have made butter from fresh cream and it's divine. They were saying that the resulting liquid isn't buttermilk, which is true. It's just skim milk. If it was cultured it would be buttermilk. When I was in first grade (1957) my class sat around in a circle taking turns shaking a jar of cream singing "come butter come, come butter come, johnnys in.......that's all of the song I remember. Once we had butter, we were each given some on a saltine cracker. I teach cooking to elementary students and this is my favorite lesson! It works best with room temp cream. We usually put it on crackers with home grown radishes. Many years ago I happened to buy some whipping cream that was a little past it's prime. When I tried to make whipping cream with my stand mixer, I got butter instead. Beats shaking a jar or turning a butter churn. I have a "butter churner" jar (knockoff of Kilner? ), but have yet to use it. This has inspired me. I've also added some of my Coffee Syrup to butter, blended it in to make "Coffee Butter". It is AMAZING, and I'm not just saying that to tout my little business. Though, of course, I'd love for more people to learn about my Coffee Syrup - ESPECIALLY creative bakers - since it can be used in so many recipes! I've made (ok, going Forest Gump Bubba here) Coffee Chantilly Cream for Cream Puffs, Coffee Caramels, Coffee Soda, Coffee Panna Cotta... and Coffee Butter. Always trying new recipes where I can swap in Coffee Syrup for sugar or maple syrup. Would love to hear others' ideas! Is it possible by any means to turn butter back into cream? Hi there. Thanks Amanda for this article. I get so busy I forget to try new small things that are fun. I don't have a mixer or food processor, and all that shaking will help per workouts! I like the 'play' of shake-them-biceps! Not to be rude with the formula, but it's 1 (cream) + 1 (energy from agitation) = 2 (butter + buttermilk). Yeah, too many science and engineering classes, but this is the more correct equation. Also, in a standard recipe, which this is (rather than a complicated molecular gastronomy recipe requiring calibrated equipment), heating/cooling requirements (187* water bath for sous vide) aren't usually written as ingredients. You might as well argue that the mason jar isn't included as a catalyst in the reaction. Besides, this is meant to be light and enjoyable reading/cooking/eating. Hmm, my bidirectional arrow was excluded from my equation after "2H2O". The parser probably interpreted it as html. The mason jar is mos def not a catalyst. It's the apparatus. Guys, scientific debate is the best. Can I use my whisk attachment on the Kitchenaid mixer? If you want to play Little House on the Prairie (Little Apartment in the Biggest Borough? ), shake that Mason jar. If you want to have homemade butter on a regular basis, bust out your electric mixer or food processor, as others have suggested. I keep ending up with clotted cream. Am I shaking it too long? or not enough? Any tips would be appreciated. Keep shaking past the thick stage until it breaks! Bee, when you take the butter from your mixing vessel, you want to press and mold it into a shape, kind of like a gentle kneading. This will squeeze more of the buttermilk from the butter mixture and will also make the butter stick together like, well, a big lump of butter—I like to do this part over a large strainer or colander. From there, just gently rinse with cold water. All this does is wash away the buttermilk from your final product—it will be done when the water runs clear off the butter. I also recommend bundling it in cheesecloth and letting it hang from your kitchen faucet to drain a little more for an hour or so, so that the water runs off the butter, too. Cultured butter, as Anita Burns mentioned, is truly the way you want to go. Your butter will have flavor and your buttermilk will have the tang it is meant to. ALL butter in this country used to be cultured: dairy farmers would keep the cream from several days' milkings during which time the cream would ferment slightly. Nowadays, those of us who don't live near grass-fed dairy cattle, must resort to buying whatever we can lay our hands on, usually ultra-pastreurized cream which will not ferment as easily as pasteurized cream. We have to help these creams along by adding buttermilk to the cream, letting it sit 24 hours or so at room temperature which, in turn, makes creme fraiche and THAT is what is churned to make cultured butter. And it and the buttermilk are just amazing. 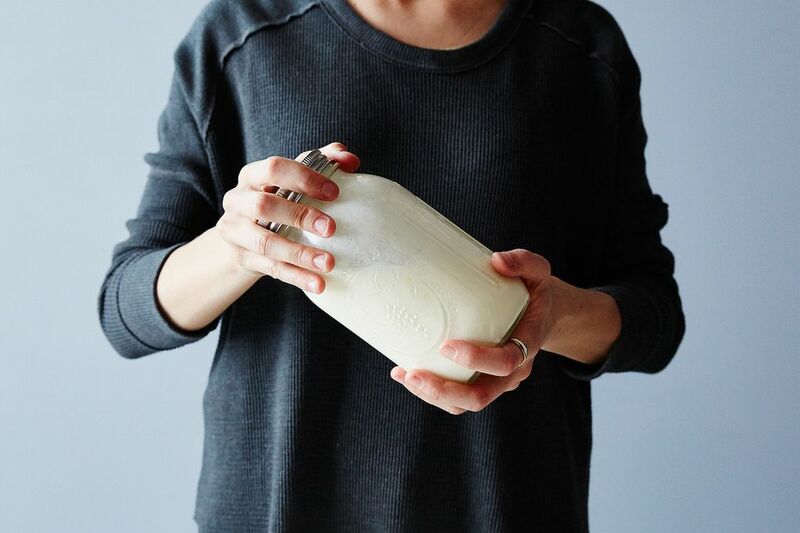 Do this once a week or so and you'll then have your own buttermilk with which to culture your cream, rather than the stuff they call "buttermilk" in the grocery stores which is not the by-product of butter-making, but simply low-fat milk with culture added. And yes, you must wash the butter and get as much of the water out as possible (butter muslin helps here), then work the salt in (if you want salted butter), which not only distributes the salt, but the working of the butter is important to create that intensely silky, creamy-smooth, dense texture of a high-quality, high-fat butter (oh...I neglected to mention you want HEAVY cream or HEAVY WHIPPING cream, not just WHIPPING cream which is lower in butterfat. I've become addicted to not only my own butter and buttermilk, but to the process itself. It is so satisfying. How much buttermilk should you add to 1 pint of Heavy whipping cream or should you use a quart of heavy whipping cream? Also, thanks for sharing your knowledge about making cultured butter. I have muslin for straining but do I need to get muslin that is specifically called "butter muslin "? How many layers or plys should I use? Thanks!